Renovating your office space, when done correctly, has a huge impact on worker productivity and satisfaction. Put aside the paint chips and fabric swatches and start first with a thorough survey of how your business and work gets done. There is no single approach that works for every company. To give your office a competitive advantage, you need to take into account your unique processes and employee profiles. Then, consider these four factors for the greatest impact to your workforce and bottom line. Do these statistics surprise you? Do you have others to share? We'd love to hear your comments. Over the next few weeks, we'll explore each of these four factors to look at how they impact your employees and what you can do to turn your working environment into a competitive advantage. The workspaces in your office have the single greatest impact on productivity. Whether you have an official policy on working remotely or not, your employees are doing work outside the office. Think about the number of emails or texts you answer during non-work hours. Expectations for work environments are being influenced by your employee’s living room and local Starbucks. There is no longer a need for large personal workspaces, especially in offices that use laptops and cellphones. Many offices have greatly reduced the amount of paper they produce. Workers no longer need to be tied to their own personal desk. The pendulum keeps shifting as to whether companies favor on-site workers versus remote. IBM and Yahoo made the biggest shift lately, requiring all remote workers to now come into a company office. There is even a gap generationally on preference. It might surprise you to know that many millennials actual prefer going into an office versus working remotely, 48% feel they are most productive when in the office. Only 19% of baby boomers felt more productive in the office. Regardless of the fact work can get done anywhere, the office remains the best place to connect, collaborate and socialize. Connected workspaces that encourage innovation and collaboration are on the rise. Provide workers with choices that match their work preferences and offer task-based work spaces. Recognize that not every task can be done in the open, offer appropriate options for privacy. In just a few years Generation Z will be entering the workforce, looking for a work environment similar to their college experience with collaborative, living-room-like spaces. 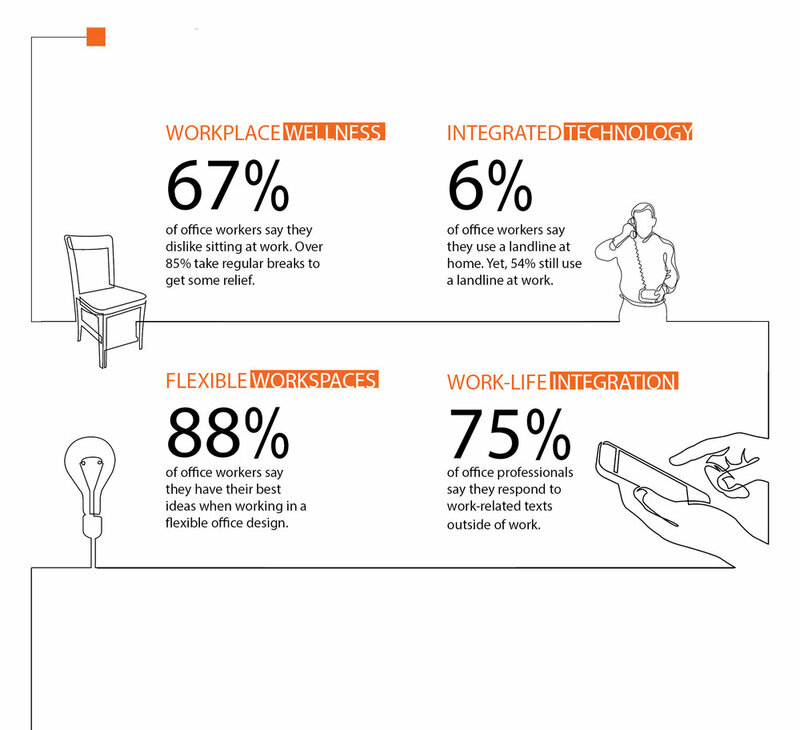 How do the different generations in your office like to work? Up next in our series... Work-Life Integration. Can't wait? Download the entire infographic here.